How to buy the best bubble hockey table? Welcome to the most complete bubble hockey guide on the internet. I rundown the options in different price ranges, how to buy a used game, and which one overall I would buy. I also talk about replacement parts for your games and how to save some money. It won’t take very long to read through this and find out exactly what you need to buy, whether it’s a game or parts. Bubble hockey is also known as rod hockey and also as dome hockey. I think what you call it kind of depends on what your friends call it or the area of you live in. 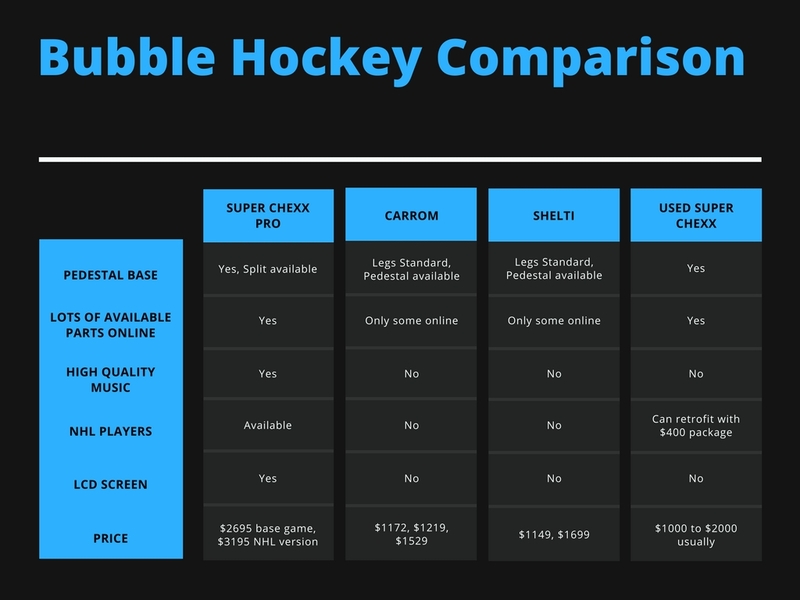 The comparison chart below overviews the four major buying options for bubble hockey, from ICE Super Chexx Bubble Hockey to Carrom bubble hockey. So what is the best bubble hockey table to buy? If you’ve got the money, then there’s only one choice, Super Chexx Pro. First made in 1983 with the original Chexx, ICE started the category and still leads it today. Built in Clarence, NY (just outside Buffalo, NY), they’ve been an arcade staple for 35 years. New games can cost $2500 to $3200, depending on whether you get the home version or the arcade version. Both versions have their plus and minuses, with the home version having a nice power on switch plus volume knob, while the commercial version has coin slots and higher resale value. I personally have an original CHEXX game that I got off craigslist a few years back (pictures are in this article). All three make sound when shots are made although only Super Chexx and Super CHEXX Pro count shots. All three have slight different commentary and sounds, although not that much different. The quality of the sound on the newest ones does seem to be better, I’ve played an original CHEXX, one from the mid 90’s, and one from the 00’s, and the one from the 00’s was definitely better for sound quality. The new Super Chexx Pro has quality that far exceeds the past efforts. Newer Super CHEXX Pro sometimes have different teams or options than USA vs Canada. The original CHEXX was USA vs USSR. The original CHEXX had a blue base, while Super Chexx and Super CHEXX Pro either have a red or black base. Some of the newer games also have a split base, which is the best option if you have narrow doors. The new Super CHEXX Pro has an LCD display, multicolor ice lighting, and goal lighting. It also has animations on the screen although they’re generic red and blue teams and not made per NHL team. The controls on the home model of Super CHEXX pro have been updated to feature volume, power, and test buttons to make it easy to maintain. The new NHL Super Chexx Pro has official goal horns for the selected teams, which is a really cool addition if you’re a big fan of a particular NHL team. Older models came with a red base but newer models starting coming with black standard. I prefer the black version myself. Where to buy a CHEXX game? They only sell direct now, so that’s your only option if you want one new. They do offer free shipping which is nice. For used ones though, craigslist and ebay are very good, but you’ve got to be quick a lot of the time. In some areas, they don’t come up for a sale very often, but when they do, they disappear rather quickly. Original CHEXX games are usually priced used between $500 and $1000, older Super CHEXX’s for $1000 to $1500, and newer games are $1500 to $2000 used. Facebook groups are also a good place to find them. Facebook groups have been slowly overtaking craigslist for classified ads, a lot of the items that would be only on craigslist are now only on Facebook. Is it worth it to buy used? Kind of depends on what you want. If the game is from a home owner and never in a bar, then it can be a great pickup used. If the game was heavily used in a bar, then you’ve got to take into account the amount of parts you might need to replace. The bubble that covers the table costs around $400 by itself, so if it’s in bad shape you might have to negotiate the table price down to account for that. Sometimes the electronics don’t work quite right and that can be difficult to sort out. Other problem areas can be the player sticks, often there is a player that has a broken stick. On the surface that doesn’t sound like a big deal, but consider that you’ll most likely have to replace the whole team in order to make them all match color-wise. What do the electronics do besides keep score? Probably the biggest thing is sound. Star Spangled Banner, crown cheers and boos, music, etc, all add a ton to the excitement. The Super CHEXX and Super CHEXX Pro versions of the game also keep track of shots, which is also fun to have. 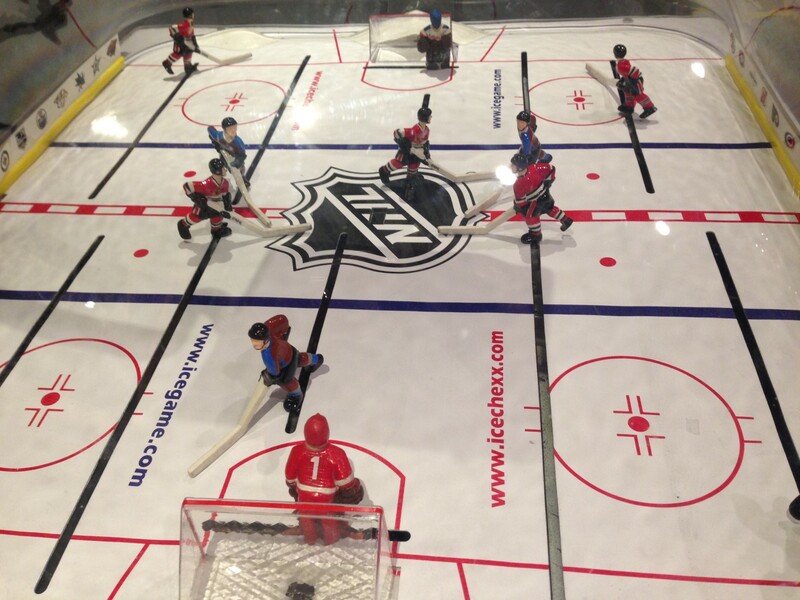 They also shoot out the puck for every faceoff, which helps keep the games even. If you live in colder parts of the world, finding a bubble hockey table to test out isn’t too hard, usually local bars and stores will have them. In warmer areas though, it starts getting a lot harder to find one to try out. Local hockey arenas are probably the best places to find one. So what are the differences between the models? Both the signature models come with players that have numbers and aren’t solid colors like the super stick hockey table. The players are either red/white or blue/white, depending on which side you’re on. The signature models also come with cup holders, which are nice. The signature leg model has a chrome brace upgrade on the legs plus leg levelers built in for those game rooms with sloped flooring. The pedestal model features what it sounds like, a pedestal over legs. The pedestal makes it about 20 to 30 pounds heavier, making it more solid during game play but also making it a little harder to move. That’s one thing to keep in mind, just because it’s not a Chexx doesn’t mean it can’t be a ton of fun. I’ve seen a lot of non Chexx games worn out from all the fun people had over the years. Plus you’ve got a warranty that you don’t have on a used game. Most reviews though say it’s not on the same level as a CHEXX game, but that’s to be expected since most CHEXX games are double or triple the price. One thing to note is if you’re looking for Carrom information you’ll likely have to search for stick hockey rather than bubble hockey. Shelti also makes games that are generally considered to be high quality and basically CHEXX clones. They’re the mid level option for people who want to buy new and not used. The scoreboard isn’t as nice but the gameplay is pretty close to Chexx level. Like the Carrom, if you buy new you’ll get the warranty and phone support which would be an advantage over buying a used Chexx. A lot of people are happy with their Shelti games though. I included an Amazon affiliate link below so you can see what they look like, basically I would recommend Shelti if you don’t want to buy a used Super Chexx and you want an upgrade over the Carrom table. You can’t lose really no matter which way you choose. Shelti makes two make different tables. There are the Blue Line Hockey Slapshot 52 inch Dome Hockey Table and Breakout Bubble Hockey Table. The two tables are pretty much the same other than one has split base (for easy moving) and the other has legs. I would probably recommend going with the one with legs if given the choice, the price increase seems to be too much for just a base. The Dome. Often years of play has dulled the shine of the dome plus left it with a done of scratches. I replaced mine right away on my regular Chexx. The cost is around $400. Rod Handles. These are often dirty and in not very good shape. I replaced all of mine, they’re not very expensive, less than $10 a handle. Goalie Nets. After years of play, the goals are usually broke or are very beat up. They’re only about $30 apiece I believe. Playing surface, or the ‘ice’. New playing surface is only like $110 and will look worlds better than the old surface, plus play better too. A lot of times the old surface will crack near the goalies and cause gameplay issues. Side stickers. While not really necessary, new side stickers will really dress up the side of the games. They’re not very expensive either. New players. Often games have broken players or players that mismatched from being replaced by whatever was available at the time. My suggestion is to buy the NHL player sets from ICE direct, they’re $99 for an entire team and are much better looking than the usual USA and USSR players that come with the default game. I bought Chicago Blackhawks and Colorado Avalanche for my personal game. When installing the new players, as a word of warning, the sticks of the players may drag on the ice. Either you’ll have to sand down the bottom of the stick some or elevate the player some. Since it’s battery operated, I can’t really see that going bad though outside of maybe some batteries leaking and causing issues. If you need gears, ice, or other parts you’ll have to contact Carrom at customerservice@carrom.com. The bulb is a #1156. There are a bunch of LED options now besides the one I used. I’m very happy with the upgrade so far. Hopefully this rundown has been helpful in deciding whether to buy a bubble hockey table or to buy something else. I started out with a foosball table 15 years ago, sold it when I had kids, then moved to a bubble hockey a few years ago. Haven’t regretted my decision at all, it’s definitely a hit when other people come over. I did get an email one time about Hard Hittin’ Hockey. Unfortunately I don’t know where to get parts for it. I’ve also gotten the question “What’s the difference between Dome hockey and Bubble Hockey”. The answer is there is no difference, they’re the same thing. 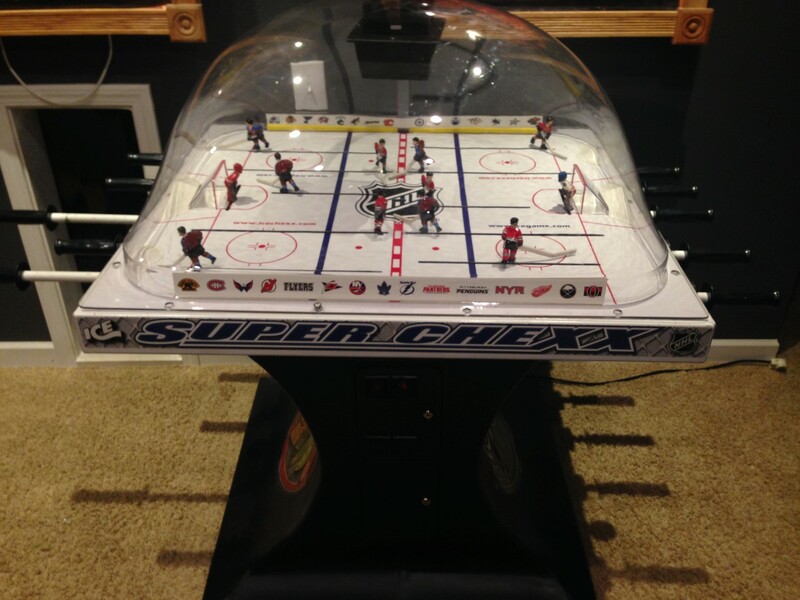 Sometimes Bubble Hockey is also called rod hockey, but rod hockey can also refer to some tables which are similar to super chexx without the dome (they have side boards similar to a real hockey rink). I’ve also gotten asked if there’s any upgrade path from any of the older CHEXX games to the new Super CHEXX Pro. Unfortunately, there isn’t, but if you really do the math that probably makes sense. Say the upgrade for everything cost $1000 and a new game costs $2695, well for most people you can probably sell your old game for around $1500 and get a new one for not much more than the electronics cost. I’m actually thinking about doing that if I can scratch together enough money, although it may be a while before that happens. If you have any questions, please email me at gameroominfo@gmail.com. Probably the biggest competitor to bubble hockey is foosball. They’re very similar in how they play, but there are also some major differences that may come into play if you have a family. The biggest difference between the two is that on bubble hockey, the rods don’t extend into the other player. Why is this important? Because if you have little kids, the first thing they like to do is jab the rod of one side into the head of their sibling on the other side, inevitably leading to crying and work for mom and dad. You can buy some special model foosball tables which don’t have rods that extend through the other side, which can fix that issue. The majority of foosball tables don’t have those rods though. The other difference is that on foosball you can reach into the table and grab the ball, while in bubble hockey the puck is enclosed. The enclosed surface helps protect little fingers and hands from accidentally getting whacked by a player. Besides that, the other thing that happens is that the kids run off with the balls on a foosball table. Luckily this isn’t possible on a bubble hockey table. One thing that is harder than foosball for little kids is turning it on. Most CHEXX tables don’t have a power switch and you have to plug them in to turn it on, which is a lot harder than just putting a ball on a table for little kids. I use a power strip to make it easier to turn mine off and on. The newer home models of Super Chexx have an external power switch which is super nice for home. One of the other options for multiplayer entertainment in your game room is a pool table. A pool table is a lot of fun, but it has one major strike against it, it takes up a ton of space. One pool table will take up more space that almost anything else you might buy. The only thing that might take up more would be a ping pong table or air hockey table. I would say generally that a pool table is great if you’ve got a ton of space to work with. If space is limited you would be better off with a bubble hockey, pinball, darts, etc that would all fit in that same space. Pool is generally great if you’ve got TV or something else to do while you’re playing. Bubble hockey requires a lot more focus, so take that into consideration. If watching TV while playing a bar game is something that you’d like to have I’d suggest a dart board plus bubble hockey combo, that way you can have both options while using less space that even a pool table would use. Question: Are there coupon codes to buy a Super Chexx Pro? Answer: No, unfortunately there are no coupon codes. Question: Does it ever go on sale? Answer: No, there aren’t any sales. The price you see now is the lowest you’re going to get. That’s the reason they sell direct now, they can control the price on every sale and keep it high. Question: Can you get custom teams? Answer: Yes! There are endless possibilities, ICE will design about anything as long as the license is available. The NHL teams are available for around $500 more but there are a lot more custom options that are available. Question: Can you fit a bubble hockey with a pedestal base in smaller vehicle? Answer: The base makes it extremely awkward to put the game in a vehicle for moving. I put mine in the back of my minivan but if my vehicle was any smaller, I’m not sure it would have fit. The split base makes it a lot easier. Question: Is the coin door option worth it? It’s an extra $200. Answer: If you’re only planning on using this in your home, I would save the money. The home edition has some nice controls that you’re going to want to have. The only time the coin door might be worth the money is if you’re planning on selling it in the future to someone who might want to put it on location.